Local Electricians Marin County: Do Electric Cars and Home EV Chargers Save Money? You probably don’t consider it when you’re tallying up your expenses at the end of the month, but transportation is really a very expensive part of running a household. When combining the cost of gas, as well as the average need for maintenance on your car and the potential of needing to get a new one, you’re already looking at a pretty high cost. That’s not considering travel expenses for transportation or insuring the various vehicles in your home. 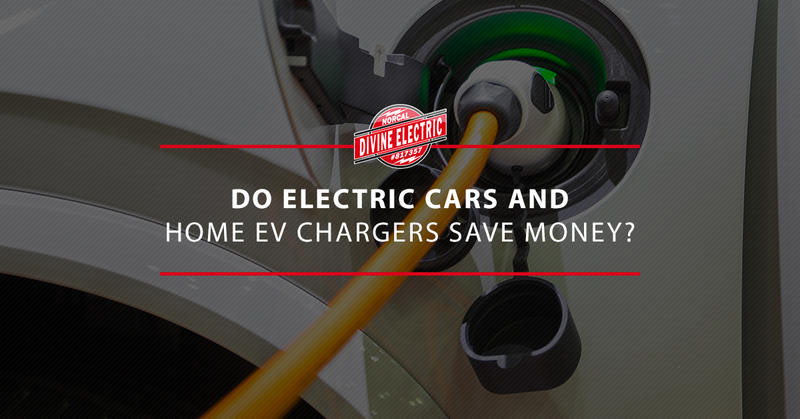 The biggest claim behind electric vehicles (EVs) these days is that they’ll save you money on transportation which ends up being the second largest expense for most households in the U.S., especially when you install a home EV charger. But is it true? How exactly do those savings come into play in the grand scheme of things? The biggest day-to-day savings that electric cars can claim is the ability to avoid paying for the ever-fluctuating fuel prices. Today it’s $3.00 per gallon and tomorrow it’ll be $3.75 per gallon. But electricity stays at a pretty constant rate. In fact, the University of Michigan conducted a study that found that electric cars cost about half as much to operate as their gas alternatives. The average cost to operate an EV is around $490, with the gas-fueled vehicles ringing in at around $1,120 a year. That’s mainly because over the last 10 years it’s only cost about $1.20 to go the same distance in an EV car that it would take around $4.00 for the gas counterpart. Not only is an electric vehicle more affordable in the long term, but it’s also much more predictably affordable than their counterparts that might seem more practical at first glance. Every year, the cost per mile for driving an electric vehicle goes down as the battery technology becomes more advanced. To put it in simple terms, an EV can go about 100 miles for every 30 kilowatt-hours of electricity which cost around $0.12 for everyone. That means that you can travel around 36 miles or ever $1.00 you spend. If you take the average gasoline-fueled car that claims the fuel efficiency of 22 miles per gallon (pretty middle of the road expectation), then you’ll only be able to travel 18 miles for every $1.00 in cost for fuel, and that’s as of right this minute, not when it switches over to $3.75 tomorrow. All of those things that can go wrong with a regular car, i.e. the transmission, radiator, fuel filters, exhausts, and plugs, don’t exist in an EV. You’ll probably recognize the names of those parts more than others, and that because they’re the things that go south the quickest. If you’re not worrying about replacing the transmission, then you’re probably not worried about spending $500+ on your car. This is the reason that EVs have such a low maintenance cost, all of those more temperamental pieces don’t get the chance to break down on you. These models will save you from replacing breaks as much, and they use regenerative braking systems that mostly use the electric engine to slow the car down rather than scraping rubber on the pavement. If you’re interested in tapping into the amazing savings with an EV vehicle the best way to make those savings stretch is with an EV charger. Divine Electric Norcal proudly installs home EV chargers for all of Marin County. We believe in sustainability for our citizen’s finances, as well as the environment. Contact us today to start pursuing EV charger installation in your home.